When it comes to fashion and wearing jewellery nothing stands the test of time better than pearls. Pearls are a woman’s way of displaying her elegance, taste and natural femininity. Although there are many traditional ways of wearing pearls, there are certain interesting and fashionable new ways to wear pearls. So, let’s take a look at some of the most fascinating ways to wear pearls! Being able to place pearls in the design of the stockings is rather a step away from the normal trends of wearing pearls. While placing them on the outer garment will surely add a dazzle to the worn jewellery of the neck, the rings, or the wrist. The pearls are to be decorated with no certain pattern. Tulle or fishnet socks embellished with pearls are also a lovely way to complete an elegant outfit. 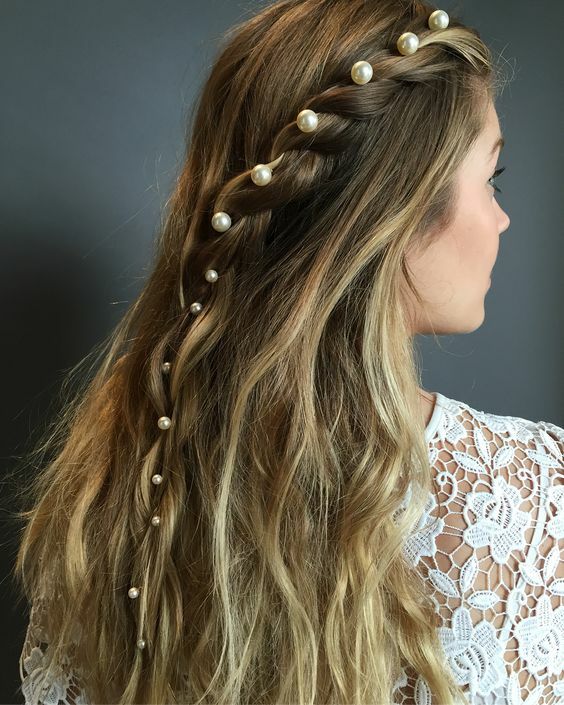 A rather unexpected way is to decorate your hair with pearls. Whether purchasing a Freshwater Cultured Pearl Set in White or any other such elegant pearl design, this is to be entwined and wrapped around a bobby pin which is to be placed in the hair. Decorating a pair of shades with pearls is often seen as eccentric. But that is the reason for creatively using pearls. By taking gluing pearls or different sizes around the frame of the shades you will achieve a spectacular design. This is surely a phenomenal way of wearing pearls and if you can’t afford a designer pair of sunglasses, here’s your alternative affordable option! Stylish purses or handbags is one thing, but having pearls sewn into the very strap is another. When carrying a purse it is often the intention of making the designer label seen, but with pearls incorporated into the strap there will be more focus on the grandeur of the pearls in connection with the designer of the purse. White pearls are usually the best pearl embellishments for straps! When it’s time to wear those beautiful feet out in public, the normal accoutrement is the toe ring and anklet pair. However, to add pearls along the anklet design will only add glamour to such a fascinating new style of jewelry. Adorning pearls this way will soon become the norm with more people becoming aware of the elegance of pearls. If you are stepping out to a banquet, wedding, or any such formal occasion where wearing of a dress is required, you can always add a touch of sophistication to your dress. Adding to the luster of the dress with pearl embellishments is one way to steal the night. White pearls will stand out amongst dark dresses as well as any other pearl design. With no specific pattern of the pearls, it is always best left up to the desires of the wearer. Showing off great nail color designs is awesome, but being able to add a pearl or two is nothing short of amazing. This way, you will be sure to turn heads and make a fashion statement with no major effort. Having pearl embellished heelsis another uncommon, yet very stylish way of showing how to wear pearls. As the feet move past the crowd, eyes are sure to look down at such a unique design. Having pearls added to the heels will instantly transform your outfit. When sophisticated styles are worn, there is often a belt involved. Having pearls stitched in various places on the belt is another way or standing out amongst the crowd. You can wear such a belt with basically any casual or elegant outfit. I personally recommend wearing it with jeans and the classic white shirt or a flirty dress! Finally, adorning the case of the phone with pearls is another unique way of showcasing pearls. You can easily dress up your phone with various pearl designs that reflect your own style and taste: vintage, glamorous, delicate or bold! So, whether you’re elegant or trendy, flamboyant or minimalistic, there are enough DIY tutorials on Youtube, in case you have some free time and want to exercise your creativity, or you can simply purchase it online.